British Superbike rider Leon Haslam says the escape from the crash that ended his title hopes has given him "fuel" for a championship bid in 2018. Haslam, 34, suffered numerous injuries, including a broken wrist and ankle, while leaping from his bike at 172mph after a brake failure at the Brands Hatch Showdown. Shane Byrne went onto win the title, pipping Haslam and Josh Brookes. 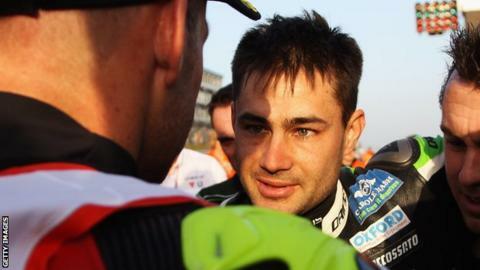 "It was an absolute disaster of a weekend," Haslam told BBC Radio Derby. "Looking back now, it's one of those moments that you can't train anyone or teach to do, but looking at the data - pulling the brake at 172mph, stamping on the rear brake to jumping off at that speed - I did all of that in less than two seconds. "I think if I hadn't have done it in less than two seconds, I wouldn't be here today. But if you look at it on a positive note, I jumped off a bike from 172 miles an hour and two days later I'm back home, I'm not too unpleased by it." Byrne began the weekend 33 points behind Haslam, who was chasing a first British championship after three runners-up placings. Byrne's own performance, technical issues and finally the Haslam crash saw the momentum swing his way. Despite his disappointment and numerous injuries, JG Speedfit Kawasaki rider Haslam went to congratulate the victor at the finish. "I'm not a rider who hates my opposition, in racing you need to have respect," Haslam added. "I can't take it away from Shane, that's his sixth British title he's won, even though I felt I deserved it and should have got it, he has to go out and win the races he's won and compete as he's done and to get that title, which he well deserved. "You don't want to see any rider crash or get hurt, and it wasn't about that for me, I was just making an acknowledgment to Shane. It's fuel for me to come back stronger and beat him."